As I don’t normally get advent calendars myself I thought I’d do something about it this year. 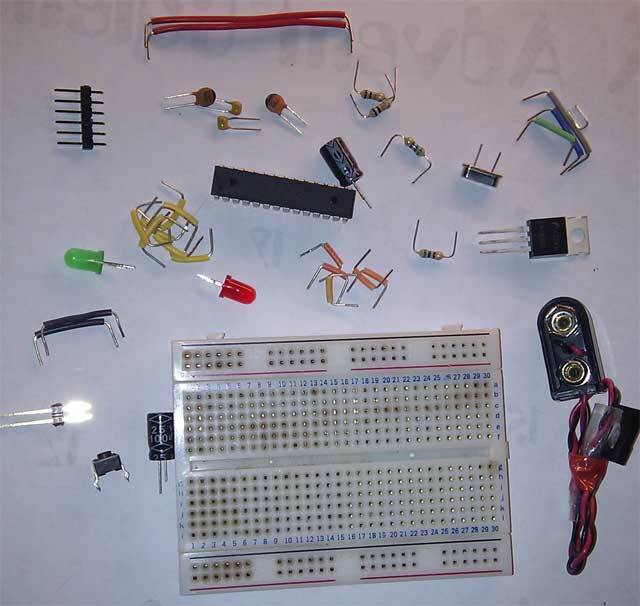 Instead of chocolate I’m using electronic parts that go to make up an breadboard based Arduino system, minus the usb to serial chip. 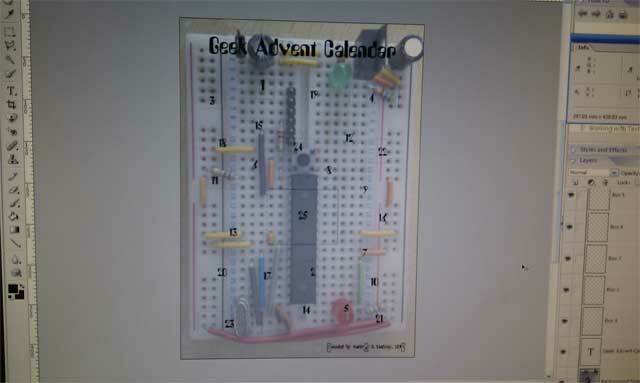 The main part of my advent calendar is made from two sheets of A3 foam board. As I only have an A4 sized printer I had to print the image in two halves using borderless printing and align them carefully. 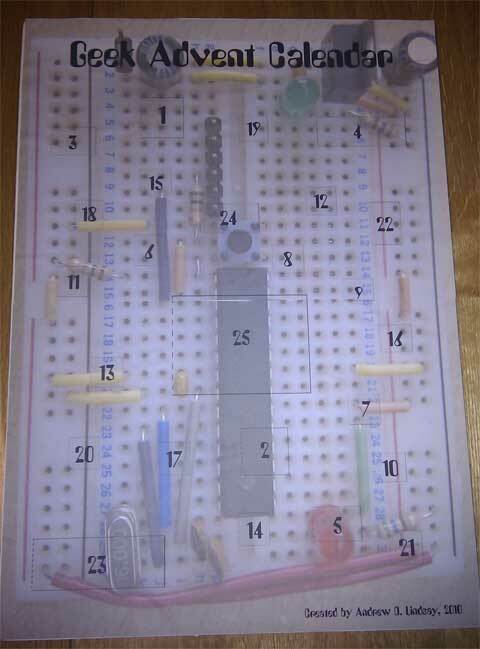 The main picture I used for the background is also a guide as to how to build up the breadboard and components. The ATMEGA168 was pre-programmed with a bootloader and simple blink program, so if it works then the red LED should flash! Create your design, here I used Photoshop Elements. Use different sized openings to fit the components. I used a minimum size of 2cm x 2cm as anything less would be too small to be practical. Collect the filling, you need 25 bits. The wires were grouped together to make 1 item. 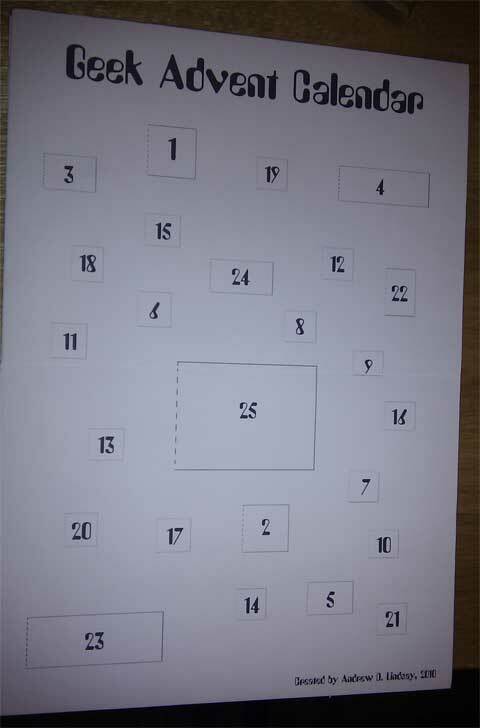 Print out your design without the background so only the boxes show This is your cutting template. Stick this firmly to one sheet of foam board using a glue stick. Cut out all the shapes to make space for the components. Glue the cutout board on top of the second foam board. I had to cut the large hole all the way through and use paper and tape to make a back this was because the breadboard was is much thicker than a single sheet of foam board. Fill all the spaces with the appropriate components. Use the foam to hold them in place. 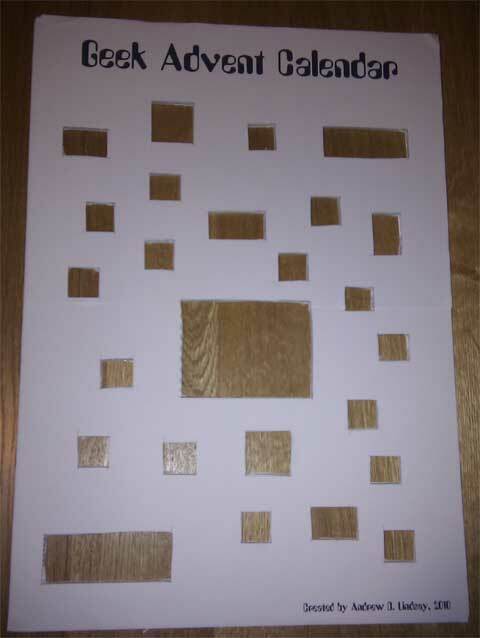 Print out and glue the full design to the top to seal all the components in. To open I’ll use a craft knife to carefully cut round three sides of the opening to create a door. 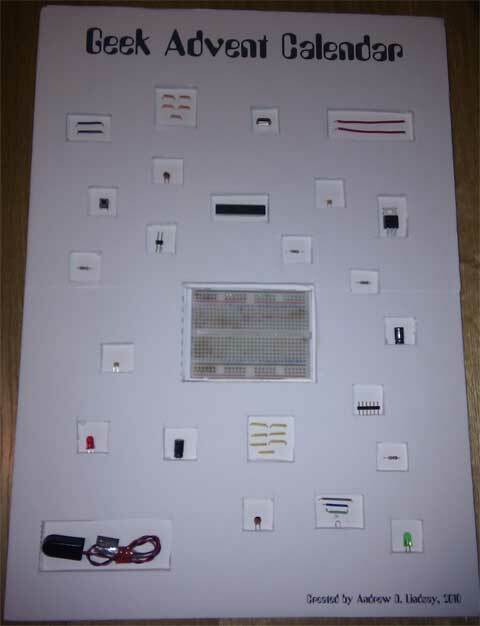 If you don’t want to use electronic components, then you could use this same method to put anything in there to create your own personalised advent calendar. That’s it. All ready to hang up somewhere and reveal a new part each day.